When nine-year-old Liesel arrives outside the boxlike house of her new foster parents at 33 Himmel Street, she refuses to get out of the car. Liesel has been separated from her parents - 'Kommunists' - for ever, and at the burial of her little brother, she steals a gravedigger's instruction manual which she can't read. It is the beginning of her illustrious career. In the care of the Hubermans, Liesel befriends blond-haired Rudy Steiner, her neighbour obsessed with Jesse Owens, and the mayor's wife, who hides from despair in her library. Together Liesel and Rudy steal books - from Nazi book burning piles, from the mayor's library, from the rich people for whom her fostermother does the ironing. In time, they take in a Jewish boxer, Max, who reads with Liesel in the basement. A life-changing tale of the cruel twists of fate and the coincidences on which all our lives hinge, this is also a joyous look at how books can nourish the soul. Its uplifting ending will make all listeners weep. "The gentle narration increases the impact of these terrible events." 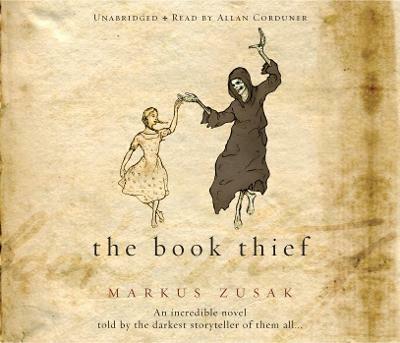 MARKUS ZUSAK is the bestselling author of six novels, including THE BOOK THIEF. His books have been translated into more than forty languages, to both popular and critical acclaim. He lives in Sydney with his wife and two children.